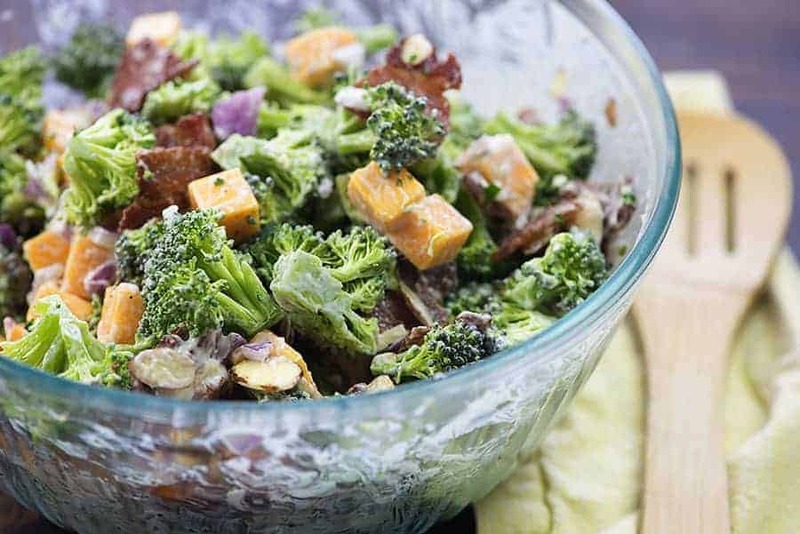 This broccoli salad with bacon is my idea of perfection. It’s crunchy and full of flavor – perfect for bringing to a barbecue or a side for any night of the week. Summer is coming (thank goodness), and that means it’s nearly barbecue season. And barbecue season means broccoli salad season! I don’t know about you, but that’s my favorite time of the year. We put in a pool a few years ago and ever since, backyard life is the only life for me. Of course, we live in the middle of Illinois, so the weather is terribly unpredictable and we’re only able to use the pool from mid-May through mid-September, but that just makes that time even more fun and precious. There is nothing better than taking a nap in the pool on a quiet weekday, except for maybe having a backyard full of people and something delicious on the grill every weekend. Along with our keto coleslaw and keto deviled eggs, this low carb broccoli salad with bacon is always a hit! 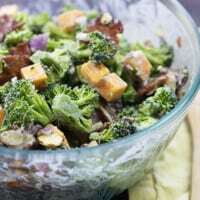 The usual broccoli salad recipe seems to have a sweeter sauce that’s full of sugar. This one does not! I went with a homemade ranch dressing for the sauce and I think you’ll love it. I mean, who doesn’t love dipping broccoli in ranch dip? 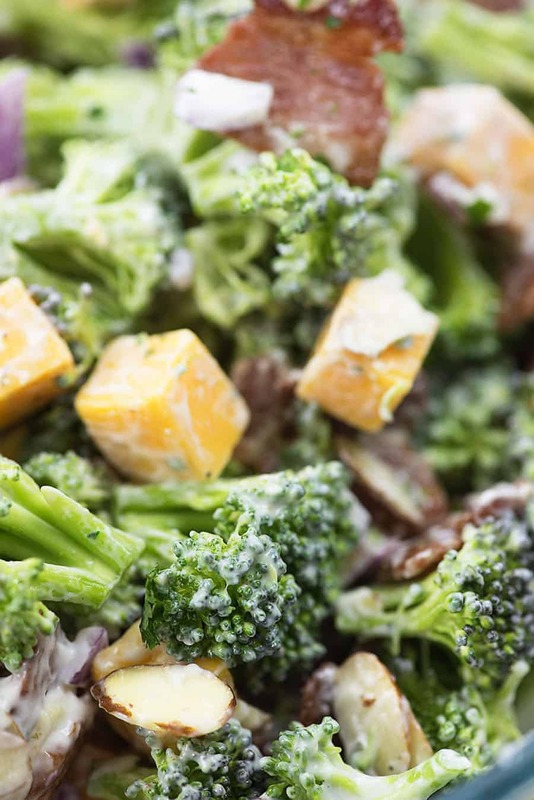 This cold broccoli salad starts with a bunch of chopped, fresh broccoli. You’ll add in a whole heck of a lot of cheddar cheese chunks. You could use shredded cheddar, but I really like the chunks because they seem more decadent and filling. Next up, add in some sliced almonds. 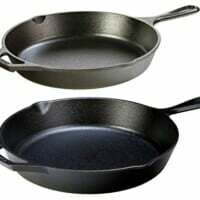 They add some great flavor and the texture is perfect. I normally add in red onions as well, but if you have onion haters around, you can totally skip this. Oh, did I forget one of the most important ingredients?? Bacon! This is broccoli salad with bacon, so we can’t forget that. I use a half of a pound of bacon and fry it crisp. 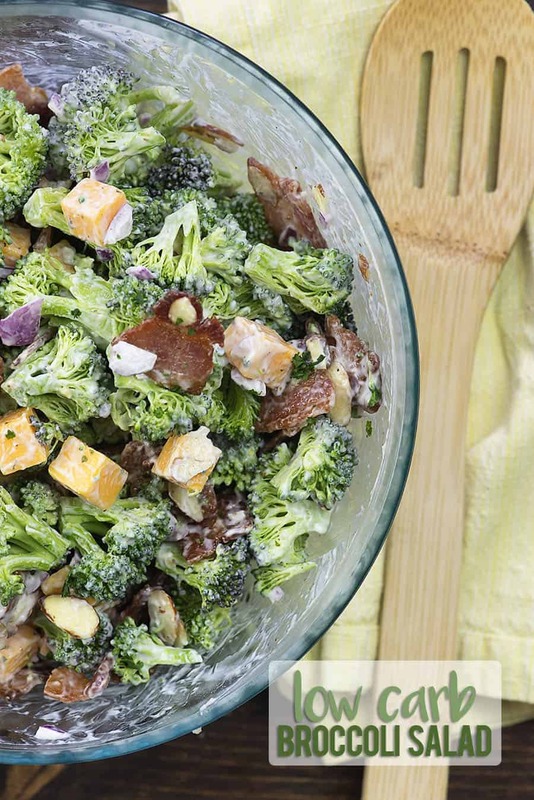 It lends the perfect salty, smoky bite to this keto broccoli salad. Low carb broccoli salad is the perfect summer side dish! 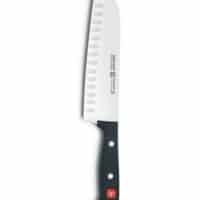 You can serve this alongside some burgers, grilled chicken, or steak. I make it all year long and keep a bowl on hand for snacking. Yes, I eat this healthy broccoli salad as a snack through the week. Weird, but delicious. If you like this broccoli salad, you might like my avocado egg salad too! 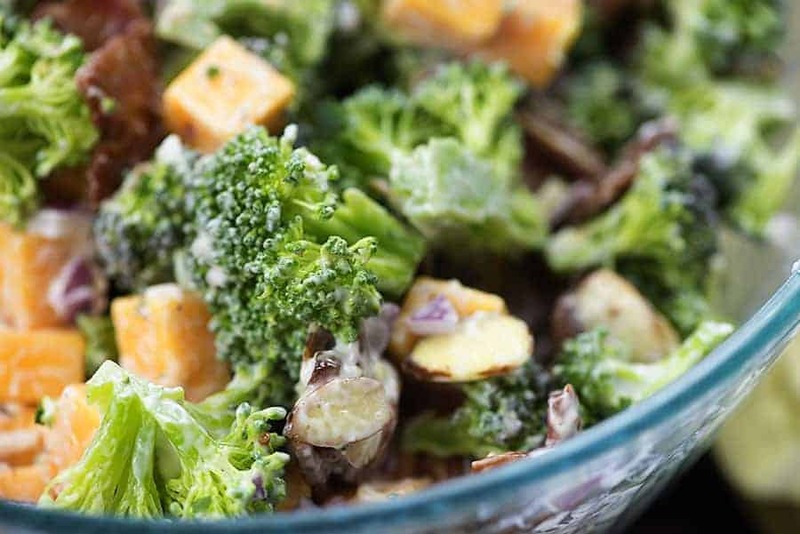 Give this one a try and let me know…is this the best broccoli salad recipe ever or what? 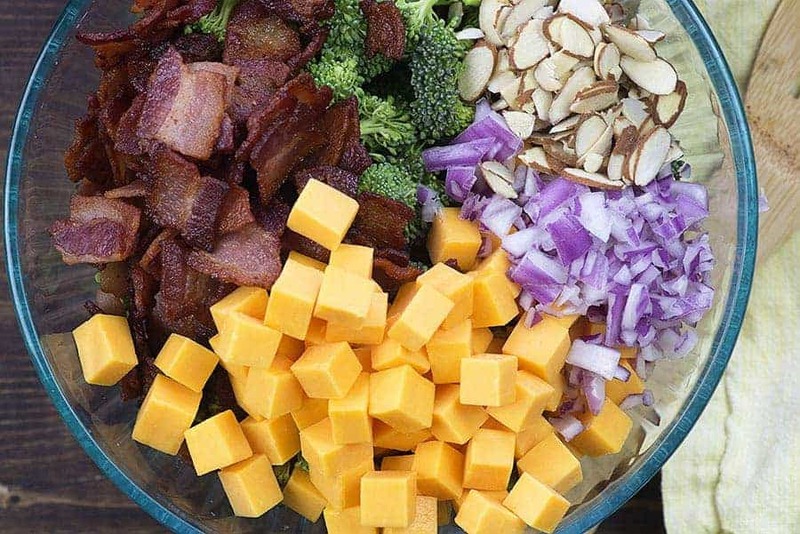 Add the broccoli, cheddar, onion, almonds, and bacon to a large mixing bowl and stir to combine. Add the mayo, sour cream, ranch seasoning, and vinegar to a small mixing bowl and stir well. Pour the dressing over the broccoli salad and stir well to coat. If you’ll be serving this recipe at a later time, store the bacon separately so it doesn't become soggy. Top with bacon just before serving. This recipe lasts for up to 4 days in the fridge, though the broccoli does become softer the longer it sits. Says serves 10, but how much is a serving? 1 cup? 1/2 cup? I didn’t measure the servings by volume. Just divide the dish into 10 portions. This is the best broccoli sald I have ever tried!! This will be my summer salad for sure. I do switch up nuts to Sunflower seeds from time to time.